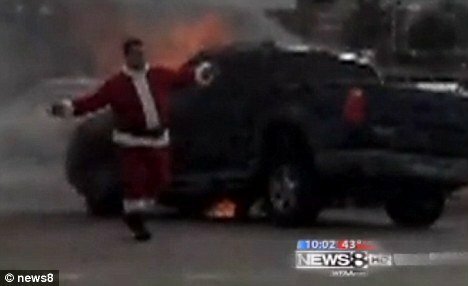 Santa Claus was spotted five days before Christmas at the scene of an accident in Dallas County, Texas, when two cars collided and one of them set on fire. Santa quickly sprang into action and pulled one of the drivers from his burning truck before directing the traffic around the crash site. Coppell Police said they have no record of any Santa Claus being at the scene of the crash. But WFAA-TV managed to locate him. Turns out Santa Claus is former volunteer fire fighter Brad Luddeke, from Arlington, who was coming home from delivering toys to families in need in full Santa gear as he does every year. Brad Luddeke told the news channel: “As soon as I grabbed (the driver’s) jacket and pulled him away, I said, <<Your car’s on fire>>. Brad Luddeke won’t admit that he probably saved someone’s life but said he was just glad to help as he lost his son, 17, in a traffic accident seven years ago. The brave man assured all the good little boys and girls that Santa won’t be late this year after his moment of heroism.